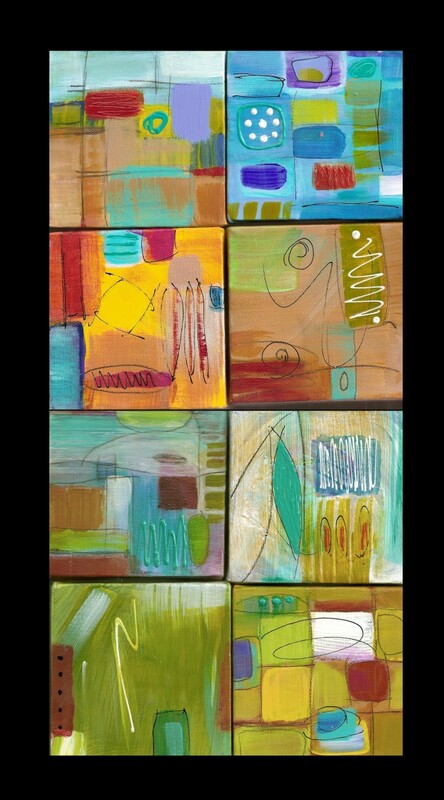 Just for fun, I thought I’d show the last eight of the little chunky 4 x 4 canvases that I sent to Key West Art Bar. These are the last 4 x 4’s I’ve done lately. They’re so much fun. I think I’ll order some more blank canvases so there will be more available for the gallery and for my Etsy shop. These are great for collage as well. Note: I’ll be returning tomorrow. This post was written ahead of time for publishing today. I look forward to reading any comments you might have! Your artwork is so colorful and fun. It looks like you had a good time creating it! Makes me want to go get a clean canvas…Thanks!! Hope you had a enjoyable and relaxing trip! I have managed to find some 4×4 and planning to do a series of small landscape ones, but lo and behold my tutor thinks anything smaller that say 10×12 is too fiddley! I think the time has arrived for small cavases also they are more touchy feeley plus you can sell them a bit cheaper, There are also some 3×4 which look even more fun. Your small canvases are beautiful as always. It seems to me that your colors are slowly shifting from clear bright to more autumn tones – or it might be my imagination! Do you think the colours are shifting Martha? Your work is beautiful. I’ve been working on 6 x 6 canvases and am having a great time – I still like working on big canvases but the small are an altogether different challenge.